Melt-in-your-mouth lamb and warming Moroccan spices – this lamb tagine recipe is best served with warm flatbreads on a cold winter’s night. Or any night. Want something quicker? This lamb, date and spinach tagine is ready in just 30 minutes. Heat a large glug of oil in a deep, flameproof casserole over a medium heat. Add the onions and fry for 4-5 minutes until beginning to colour. Add the garlic and all the ground spices and fry for 2 minutes more, stirring with a wooden spoon. Season the lamb, then add it to the pot and cook for 5 minutes, stirring regularly. Add the chopped tomatoes, prunes, stock and sugar and bring to a good simmer, then reduce the heat to low. Add 100ml water and simmer gently for 3 hours. Stir the tagine every so often so it doesn’t stick and burn on the bottom. If it reduces and thickens too quickly, add a splash more water to loosen it. You want a rich sauce that’s still fairly liquid. For the last 30 minutes of the cooking time, stir in the chickpeas and lemon juice. Taste and season with salt and pepper. Serve scattered with parsley, coriander, pistachios and pomegranate seeds, with couscous or flatbreads (you could try one of these flatbread recipes) as an accompaniment. 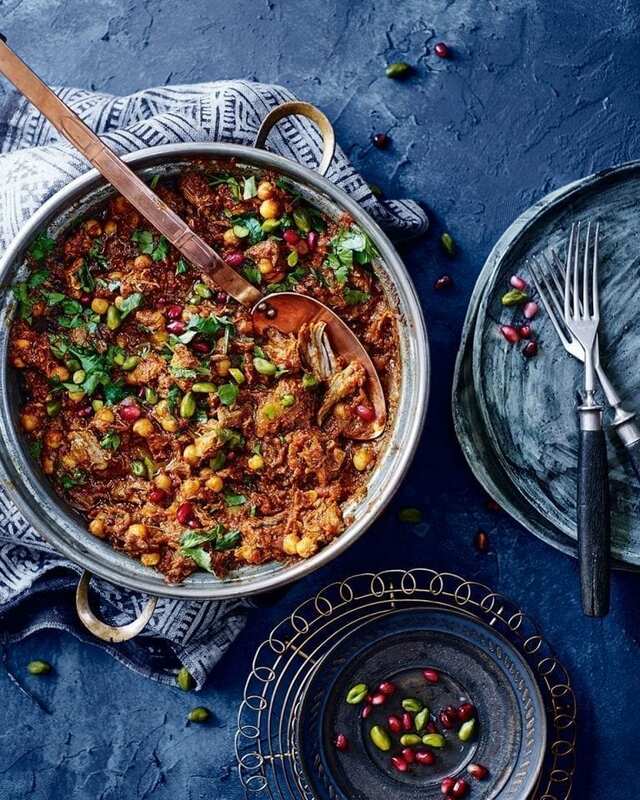 The tagine can be made up to 24 hours in advance (without the herbs, pistachios and pomegranate seeds) and kept in a sealed container in the fridge. It can also be frozen for 1 month in a sealed container. Sprinkle the tagine with the garnish just before serving.